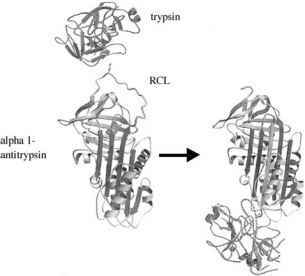 the target sequence containing the region of interest is amplified by PCR. The use of one biotinylated amplification primer and one unmodified amplification primer generates a product that is biotinylated on one strand. A wide range of target size (from <100 base pairs to >1000 base pairs) can be accommodated on electronic micro-arrays. For genotyping analysis of two or more targets from a sample, multiple oligonucleotide primer pairs can be used in a single amplification reaction, which will generate multiple biotinylated DNA targets. After the amplification reaction, desalting with size exclusion membranes is performed to facilitate electronic transport and remove unincorporated amplification primers. The biotinylated targets are then electronically addressed onto NanoChip cartridges. Software on the workstation enables the user to designate the test sites to be addressed for each sample. Electronic activation concentrates the biotinylated DNA in the sample to the test sites, where the DNA remains anchored via interaction with the streptavidin in the permeation layer. Unbound nucleic acids are removed by a series of fluidic washes before addressing the next sample. When multiple NanoChip cartridges are processed in a single loader run, cartridges are loaded in parallel, minimizing the time required for electronic addressing. One method for sample genotyping uses fluorescently labeled reporter probes specific for the wild-type and variant sequences (Fig. 2). For target sequences containing significant secondary structure near the SNP, an unmodified ''stabilizer'' oligonucleotide can be used; this oligonucleotide hybridizes to the target sequence immediately adjacent to the nucleotide of interest (Fig. 2). Hybridization of the stabilizer next to a perfectly matched reporter probe generates a base-stacking energy component that, added to the Watson-Crick base-pairing energies, further stabilizes the reporter/target interaction. An alternative method utilizes chimeric ''discriminator'' oligonucleotides that contain a target-specific region, complementary to the wild-type or variant alleles, and one of two universal tail sequences. Two fluorescently labeled universal reporter probes, each complementary to one of the tail sequences, are used to detect the bound discriminators. Whether allele-specific reporter probes or allele-specific discriminator oligonucleotides/universal reporter probes are utilized, genotype determination is achieved by monitoring the fluorescent signal remaining on each test site after the mismatched allele-specific oligonucleo-tides have been destabilized. Mismatched probes are removed by increasing the stringency of the environment, either thermally or electronically; perfectly matched probes will remain hybridized under the more stringent conditions. 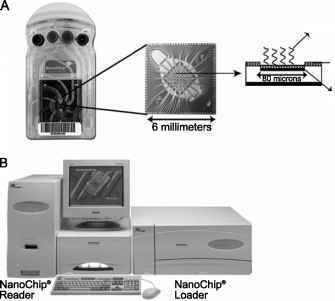 The NanoChip reader uses a two-laser system to detect the fluorescent signal remaining at each test site. Fig. 2 Genotyping on electronic microarrays. 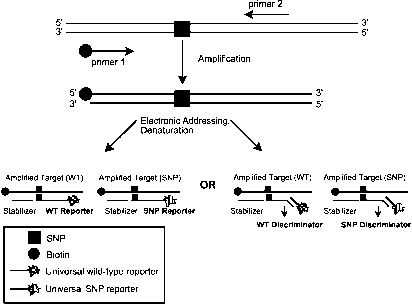 The region of interest is amplified from genomic DNA by using one biotinylated amplification primer. After electronic addressing and denaturation, allele-specific reporter probes or allele-specific discriminator oligonucleotides/universal reporter probes are used for genotype determination (see text for detail). The use of stabilizer oligonucleotides is optional. Predominance of fluorescent signal from one labeled reporter indicates a sample that is homozygous for the corresponding allele, whereas equivalent levels of fluorescent signal from both reporter oligonucleotides indicate a heterozygous genotype.